Fr. Stan grew up in a military family with long-standing roots in the southeastern United States. His religious tradition was military Protestant (military chaplaincy was, at that time, divided as Jewish, Protestant, or Catholic). During college, he was confirmed in the Episcopal Church at the Cathedral of St. Andrew in downtown Jackson, Ms. He went to seminary from that parish, was married in that parish, and was ordained deacon in that parish. Fr. Stan has been rector of St. Paul’s since March 1, 2006. Additionally, he oversees the chaplain role at the Day School as well. Fr. Stan is responsible for the liturgical, catechetical, spiritual, and pastoral activities of the parish. In addition, he is most engaged in discovering the interface of religion and the world, especially in matters related to admonition of the prophet Micah to do justice, love mercy, and walk humbly with God. Fr. Stan is best known in the Episcopal Church for riding around Austin, TX during General Convention 2018 on an electric scooter with the Episcopal Church flying in the breeze. Fr. Jonathan is a former Roman priest who was received into the Anglican tradition and ministry in the Episcopal Church in November 2017. He is a full time educator who loves working with immigrant students, teaching English language learners (ELL) at the high school level. He is on staff at St. Paul’s with the understanding that he prioritizes cover for other priests in the diocese when needed. He usually presides at our Wednesday evening Holy Eucharist and at the new Sunday evening Mass in Spanish. 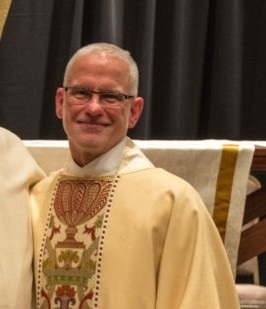 He discerns a call of presence and support to those who are transitioning from the Roman to the Anglican tradition as well as a great love for the Queer community and hopes to be more engaged in these ministries when he quits teaching school full time. He is our resident bee keeper for the pantry garden and loves talking about ‘the ladies’ and their hard work on our behalf. Heidi grew up through a variety of protestant traditions, landing squarely in the Anglican world while in seminary in 1985. Heidi was hired as the Lay Ministry Associate to the Rector beginning in Advent of 2018. Her primary ministry here is to help the congregation discern their vocations, and empower them walk in them with God’s help, through preaching, teaching, and ministry facilitation. Heidi has what she calls “a slight Harry Potter problem” and enjoys watching her son make music. Sam, the son of a preacher, grew up and has lived in many areas around the country including, California, Indiana, Kentucky, Nebraska before landing in Kansas City, Missouri in 2007. He has been the choirmaster at St. Paul's since 2011, and the director of music since 2013. He is passionate in his vocations as a music educator, and also in the pursuit of finding beauty and spirituality through the performance of great music. He lives in Union Hill, Kansas City, with his beautiful wife and soprano, Sarah Tannehill Anderson. Nicole grew up in a suburb of Kansas City, found St. Paul’s just before her 28th birthday (don’t ask how many years ago that was…), and has been singing in the choir ever since. She was hired as the Parish Administrator in September of 2011. Nicole has been married to Tony Lux since June of 2018 and is stepmom to Mallory and Wyatt. She feels fortunate to work among and around friends and “family” who put up with her love of dogs and Musical Theatre. Kurt was raised by Pentecostal Lutherans and wandered through various denominations until he found a calling to contemplative spirituality in the Anglican tradition. He began serving as organist at St. Paul's in the summer of 2016. His primary ministry involves providing organ music for the services by playing masterworks, improvising, accompanying the choir, and playing hymns. Kurt also works as a composer and on his company MusicSpoke. Kurt is a well known composer and has a following on facebook where he posts the occasional organ practice. Janice is married to Wennekota and has one beautiful girl, Chloe. Janice is St. Paul’s part-time receptionist, and is responsible for being a friendly voice on the other end of the line, as well as having a welcoming smile when you visit the Church. Her hope is that people can see Jesus through her in her interactions with everyone that walks through the door or calls. Janice loves marine wildlife and would have loved to study marine biology, but now enjoys watching her daughter grow and have her own dreams. Cory grew up in Northeast Ohio (Kent State area), and has been married to Addrianne for 21 years, they have 3 children Schyler, McKenna, and Oscar. Cory’s role is to maintain & repair the church & grounds and oversee the cleaning crew and other contractors. His desire is to see no one go hungry in this world. Cory is a former mailman of 17 years and walked enough miles to circle the globe 1 1/2 times. In addition to enthusiastic service throughout the week, Jose lovingly brings a weekly version of the miracles of abundance to our Sunday Coffee Hours.